The fact that retaining existing customers is less expensive than acquiring new ones isn’t exactly a novel idea. It’s very well documented that customer acquisition costs 5 to 25 times more than customer retention does. If this is true, then why, per data from Invesp, are only 40% of companies and 30% of agencies putting equal focus on both customer retention and customer acquisition? The number of new customers and growth rate are appealing numbers to show off, but if you’re not retaining customers, you’re going to end up spending much more to make up for them than you would if you invested in turning your current customers into fans, advocates, and promoters. At Real Thread, we work with a ton of teams who are investing in brand loyalty and customer acquisition. Here are some of the lessons we’ve learned, and what your company can do to begin creating promoters and ambassadors for your brand or client. And, if you want to learn even more about nurturing your prospects into promoters, you can join IMPACT and Real Thread for an upcoming webinar on January 24, 2019, at 2 PM EST. One of the most widespread misconceptions about brand loyalty is that it begins after your customer has made their first purchase. The brands building the most loyalty though, are the ones who acknowledge that creating a lifetime buyer starts at the beginning of the customer experience. Customers don’t simply buy a great product or service — they want the purchasing experience to be personal and enjoyable. As much as you may like to think that your buyer will make their purchasing decision based on the product and price alone, it’s simply not the case. Just as they’ll remember your product, prices, or features, they’re also going to recall their emotions, and how your brand made them feel during the purchasing process. This is where our opportunity is as marketers. Yes, having a good product is important, and if you have a bad one, your customer will find out eventually. But just as important is the journey you take your customer on. Customer retention goes beyond the discovery and first purchase stage of the customer lifecycle, but know that it starts here, and your customers are waiting to be delighted. There are an endless number of ideas that people will say create brand loyalty, but it really boils down to this: consistently delighting your customers. To do this requires keeping the customer at the forefront of every decision. Apple recognized this a number of years ago, and it changed the way they thought about their customer experience, and consequently, how people interacted with their brand. In a 2016 TED Talk, Tony Fadell, the designer behind the first iPod, shared how considering the customer experience and how to delight the customer changed how people interacted with their brand. Excitement for the first iPod was incredibly high, as people saw it as a revolutionary piece of technology and the marketing team had done a great job of positioning the release as a new, forward-thinking product. What Tony focused on as a product designer was keeping that positive momentum going post-purchase. Since this piece of technology was new to, well, everyone, his team’s job was to make it as intuitive as possible so that there was little to no frustration. The goal was to ensure that the only sentiments that customers would associate with the iPod were positive ones. One tiny but significant detail his team deemed crucial: ensuring the iPod had power. At the time, most electronics came without batteries, or without any battery life. So when customers were opening their products for the first time, rather than being able to use it right away, they’d have to wait, and all the positive momentum from their customer experience was put on hold. Recognizing this, Tony’s team at Apple delivered the iPod with full battery life, so that from the moment their customer unboxed their beautiful new iPod they’ve been dreaming of , they’d get to start using it, thereby carrying all of that positive emotion through to the first use. This is a perfect example of constantly delighting your customer beyond purchase. Technically, the job was done. The product had been purchased. But this small factor of maintaining positive feeling between the customer and the brand is what can make the difference between a one-time buyer and a brand loyalist. From the example above, you can see that creating these moments of delight doesn’t have to come with huge, sweeping change. Often, they come through small, simple steps. That being said, here are 5 ideas you can use for delighting your customer and creating loyal brand promoters. Include a hand-written note. Simple enough, right? When so much of how we communicate is done digitally, a hand-written note to a client or customer goes a long way. It’s personal, and it shows the recipient that for as long as it took to write that note, you were thinking about them, adding delight to their day. Incorporate video into your communication. Video is having a moment in the sales and marketing world right now. Companies like Vidyard are making it incredibly easy to add quick, friendly videos into your communication with customers. Quick touches like this are easy to make, and people love getting to see the humans behind the brand. Send them some company swag. This is an area we’re well versed in here at Real Thread. 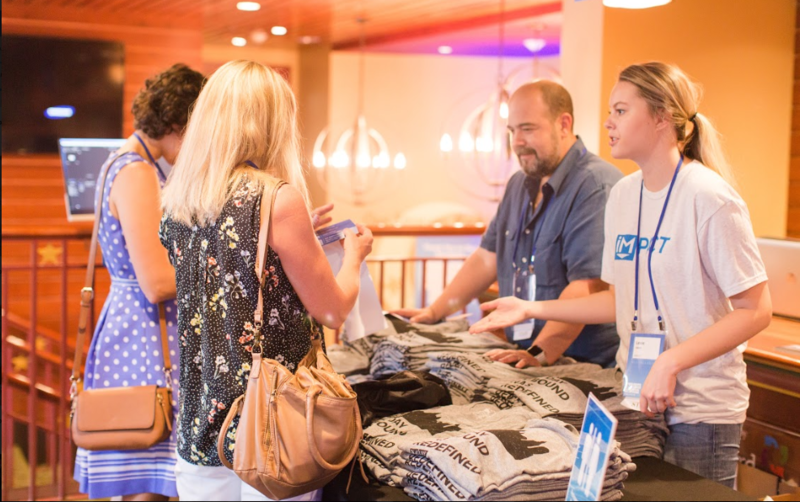 Having worked with countless brands who are using t-shirts and other swag items as part of their customer retention strategies, we know this is one that gets customers excited. Giving your customers a way to promote your brand will further enhance their ambassador-ship. For more on selecting good company swag, head here! Make clever microcopy a priority. Good headlines and campaign slogans are important, but the experience is in the details. Clever, well-thought-out microcopy will make mundane experiences like filling out a form or entering billing information surprisingly delightful. Encourage them to share on social media. This is one of the points where customer retention and customer acquisition meet. Giving your delighted customer a prompt or careful nudge to share their experience not only solidifies their own personal investment in your brand, but it gets the word out to others. The more a person shares about your company, the more they’ll feel a personal investment as well, so anything you can do to encourage that will help you retain customers, as well as gain new ones. In the marketing world, there’s a ton of pressure to always be making headway in the areas of growth and acquisition, and it’s easy to get caught up solely in metrics focused on new customer acquisition. This is all well and good, but don’t let customer retention fall by the wayside. Turning your customers into lifetime brand loyalists has the potential to dramatically increase customer lifetime value, which in turn will increase revenue at a much more cost-effective rate. So, start building off of these ideas and create an experience that will surprise and delight your customers.